My hidden transmitter apparatus. The Byonics PicCon turns my 2-meter rig into a fox. Fox hunt controller? 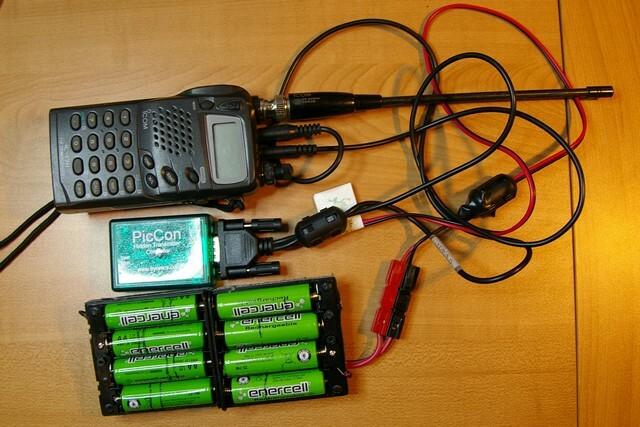 I need something to turn my two-meter transceiver into a hidden transmitter. Believe me, I searched the Internet. There are lots of references, but precious little in the way of easy-to-build circuits. The May, 2010, QST has an article on page 33 for a complete combination fox controller and transmitter. But I already have several two-meter transceivers! Finally, after a major search, I chanced upon the Byonics PicCon. I already have the Byonics TT4 APRS tracker controller, and as it turns out, the inexpensive PicCon uses the same cables, so I didn’t have to create those! Byonics PicCon Hidden Transmitter Controller. Click on image to go to Byonics PicCon site. The device is simple, and is available in kit form with the green plastic case for US$42.00, not bad (built and tested is $66). I ordered one. It arrived promptly. I pulled out my soldering iron and magnifying glass and went to work. There are no surface-mount devices, thank goodness. The DIP ICs go into sockets, which makes things much easier. I had it assembled in one evening, and that was taking my time! The device is programmable. I experimented and finally came up with this sequence: At the beginning of the sequence, it beeps once, then there’s ten seconds of just carrier (no audio). Then it beeps twice, followed by another ten seconds of carrier, then beeps thrice and ten seconds of carrier, then the Morse ID of KEØOG/FOX. After that it turns the transmitter off for about twenty seconds, then repeats the whole thing. Excellent instructions for building the kit and programming the device are found on the Byonics PicCon web page. The default program had all sorts of tones going all over the place. My hidden transmitter location device (I call it the Fantastic Fox Finder), built around a circuit designed by Dave Sharpe, KIØHG, creates a tone when pointed away from the fox, and a null in the tone when pointed correctly. Well, the tones created by the PicCon made it hard to hear the FFF’s tone. That’s why I changed the sequence. At the upcoming May, 2011, Montrose Amateur Radio Club meeting, I’m going to hide my PicCon-controlled hidden transmitter (picture at top of post) on the premises to give members a taste of fox hunting. From there we’ll go to a larger venue, such as a park, then to an even larger venue, such as somewhere in the forest, and then to a city-wide hunt. I’m also giving a presentation on hidden transmitter hunting (fox hunting). I’m charging up all the batteries so all will be ready! Doug, the PicCon kit can be found at http://www.byonics.com. They’re still for sale as of today. Are you still selling these? If so how do I order and what is the price? Will, the reset procedure from the manual is this: Press and hold switch SW1 [the pushbutton] and send DTMF 0 [zero] at the same time. This will clear all previously programmed options. LED D1 will flash twice after reset. I have forgotten what my secret code is to unlock the DTMF codes. Does anyone know how to find the unlock code in the PicCon?